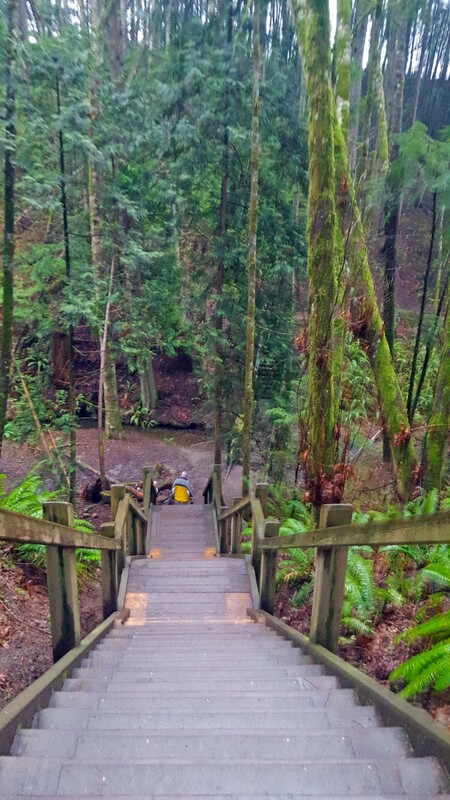 The stairs in Latoria Creek Park need to be replaced, and the City of Colwood is applying for a grant from the Canada Infrastructure Program (ICIP) to cover the cost of the work. If successful, the grant will fund 73% + City Reserves will fund 27% = ZERO Tax Increase for this work. The City will then begin budgeting sustainable funds for future replacement over time. How many stairs are there in Latoria Creek Park? There FOUR long steep staircases in Latoria Creek Park, each with up to 112 stairs. The work would be done over three years. Where are the stairs located? The first set of stairs is almost a kilometre along a narrow forest trail in a deep ravine, with the creek far below on one side and rocky slopes rising steeply on the other side. What challenges does the location present when repairs or replacement are required? Materials cannot be trucked or craned in to this location deep in the park. They would need to be fabricated off site and transported in sections. Would the work to replace the stairs be hazardous? Yes, footings would need to be installed on steep sections of the cliff. How many footings are required to support the stairs? 74 footings would need to be removed and reconstructed. Is the City paying $325K for new stairs? No. That amount is one of three rough estimates used in an application for a Canada Infrastructure grant to cover the cost of replacement. This amount is the highest of the three estimates, and comes with the longest life span, lowest maintenance costs, and lowest overall cost for the City and taxpayers over time. The estimates include detailed engineering design, materials and construction. Detailed costing would be done as part of an RFP once the results of the grant application are known. What materials are proposed in this cost? This would be for an aluminum structure combined with wood components to fit with the natural forest setting. A 2018 inspection revealed that several stairs were rotting and unsafe. At that time, an assessment was done, and it was determined that the supporting structure was also compromised. Temporary repairs were done to the stairs (as seen in the photo where new wood is visible) and staff began planning for replacement to ensure the long term safety and usability of the stairs.